Save big $$ - Call us about our damaged magnets. 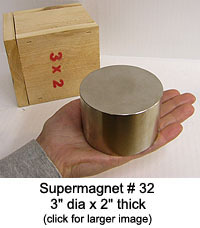 Damaged magnets have the same power & performance as new magnets. Don't email - please call - our damaged magnet stock can change quickly. 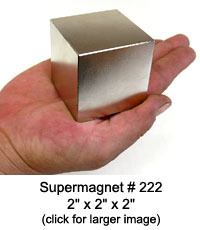 If you really need unbelievably powerful magnets, here they are. Uses include magnetic steering of nuclear particles in accelerators, levitation devices, magnetic beam amplifiers, scrap iron separators, etc. If carrying one into another room, carefully plan the route you will be taking. Sensitive instruments like CRT monitors will be affected in an entire room. Loose metallic objects and other magnets may become airborne and fly at great speed to attach themselves to these magnets. If you get caught in between the two Supermagnets you can be severely injured or killed. These magnets will crush bones in the blink of an eye. 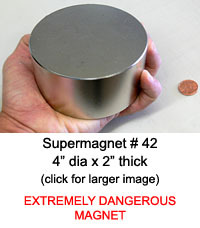 Two of these magnets close together can create an almost unbelievable magnetic field that can be incredibly dangerous. Two Supermagnets can very easily get out of control, crush fingers and instantly break ribs or even your arm if opposing poles fly at each other. NEVER ALLOW CHILDREN NEAR ANY OF THESE MAGNETS! 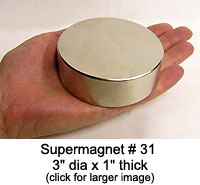 The disc Supermagnets are Axially Magnetized (the top & bottom flat faces are the north & south poles). ?The poles on Supermagnet #3 are the large 2" x 3" faces on opposite sides. 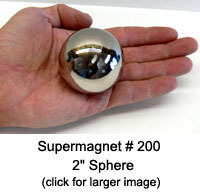 The 2" sphere is magnetized like the Earth, the top hemisphere is North, the bottom is South. We can only ship these magnets by ground UPS - they cannot be shipped via air as it will interfere with the aircraft's navigational equipment. 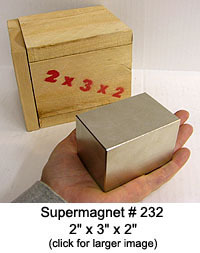 All Supermagnets are packed in either small wooden boxes or with large blocks/panels of Styrofoam in double-wall cardboard boxes to minimize the external magnetic field. 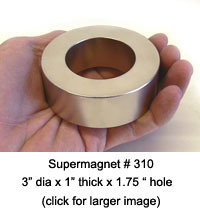 These magnets are rated at Grade N45- 12,500 gauss. Ni-Cu-Ni Plated Neodymium magnets with Matte finish. 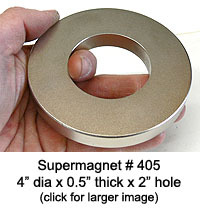 4" Dia x 0.5" Thick, ( 2" hole ) NdFeB Ring Magnet, highest grade available, Ni-Cu-Ni Plated with Matte finish, Axially Magnetized (the top & bottom flat faces are the north & south poles). Theoretical maximum pull: 155 pounds.